Home » Beauty • Product Reviews » Eyewear? eyewa! 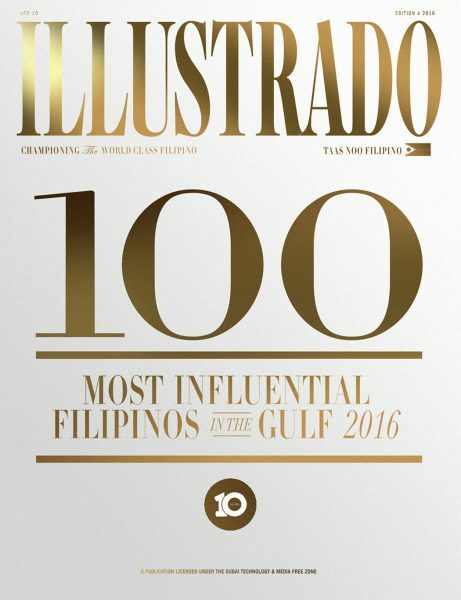 A couple of weeks ago, we were approached by a representative of eyewa, an online store for everything eyewear store in the Middle East. They offer thousands of different eyeglasses, sunglasses and contact lenses. 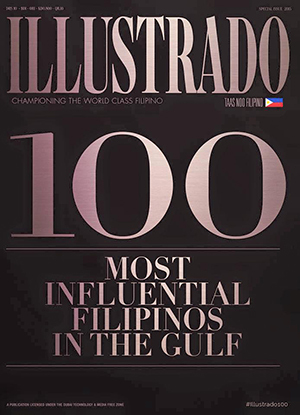 They carry popular brands like Ray-ban, Fendi, Chloe, Lacoste, Acuvue and Solotica. They also have color and prescription contact lenses. They wanted to send us some products for us to try shopping their website and try our choices on. Of course for someone like me who’s been wearing glasses and contact lenses since I was on my third year of high school, this offer is hard to pass on. I need prescription contact lenses pronto because I just used all of the ones I had a month ago! Reina wanted to try wearing contact lenses too so we went to their website and chose our lenses! Since I have poor eyesight, I need contact lenses with prescription. 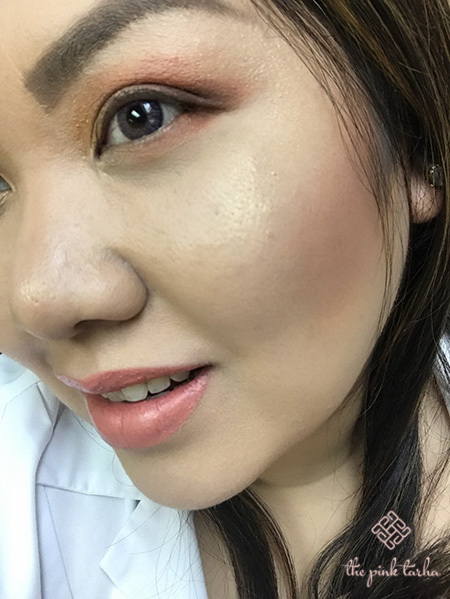 I normally wear dailies, or contacts that can be worn only once. After wearing it, I can throw them away already. No need for lens caps and lens solution. 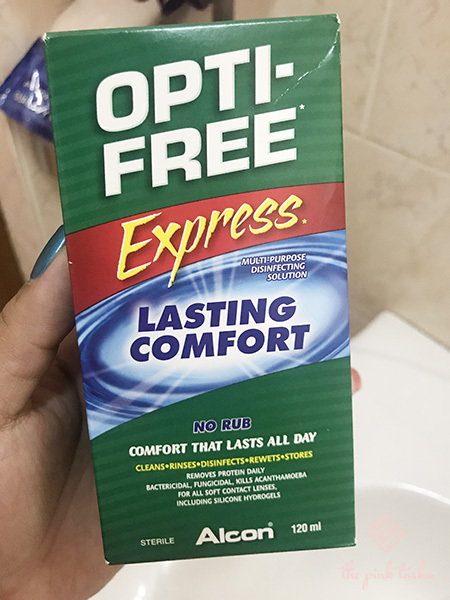 This type of contacts work for me because my eyes get easily irritated. I don’t wear contact lenses daily though; I only wear them for special occasions or when I need to do activities that requires me to not wear eyeglasses. So I want something low maintenance and no need to store it for a long time. I usually wear Define Acuvue 1-Day contact lenses. It comes in 1 pack of 30 pieces and they also come in designs that enhance the eyes. I love Vivid Style the most. They’re available in eyewa: Natural Shine and Vivid Style which cost around SR 170 per pack. They’re SR 200 in optical shops here in Riyadh. 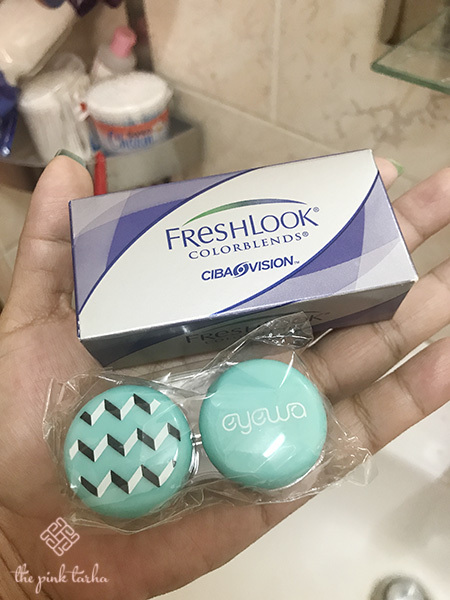 This time, I wanted to try another brand and another style so I chose the FreshLook One-Day Colorblends, also a pack of 30 contacts (SR 189). It has different color options: blue, green, gray, and hazel. Since my eyes are already brown, I did not choose hazel. I don’t have the confidence to wear colors that are far off from my natural color so blue and green are out. Gray is the more subtle one among the colors so I went for it with -2 grade. 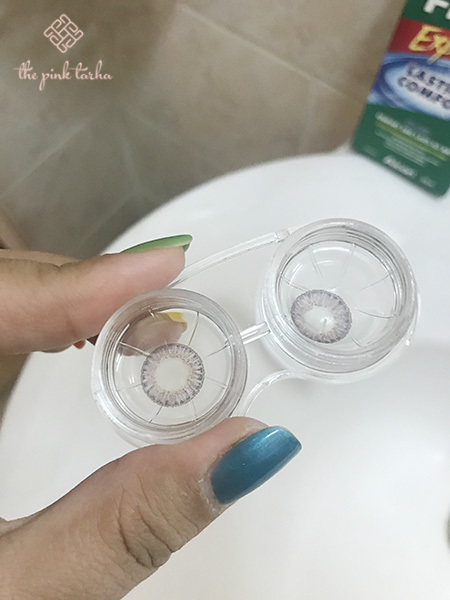 One of the disadvantages of buying contacts online is that we don’t get to see the contacts personally and will only have to rely on photos and hope for the best. This proves difficult if we’re getting colored lenses. If it’s only clear lenses, then it would be pretty easy and straightforward. I also gave in to choosing a longer wear contact lens. The Core Lens, good for 6 months (SR 150), looked so beautiful on the model’s brown eyes. The Core Lenses has a range of 12 colors ranging from grays and browns that suit any skin tone (but most especially morenas). I picked the color Onyx which is one of the bestsellers. I’m just hoping they don’t irritate my eyes like most long-wearing lenses do. Cute note from eyewa. Thanks! Excited to open this package! 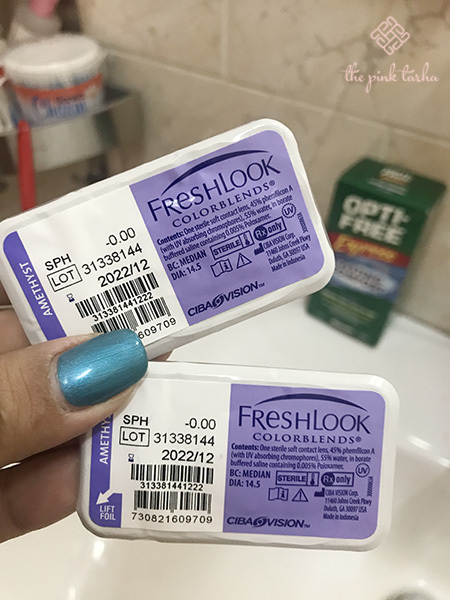 When the contact lenses arrived after a few days from ordering it, I was really excited to see what the color contacts look like. The FreshLook Colorblends in Gray look subtle and I put it in my eyes, they created a shift in the colors of my iris but nothing too drastic. I like the effect on my eyes. It was easy to put and easy to remove. However, it wasn’t the most comfortable. I can feel that I am wearing contact lenses. If you’re a long-time wearer of contacts, you know that there’s a time wherein you get comfortable wearing them that you no longer feel them throughout the day. This time though, I know the lenses are on my eyes and I could only muster 3 hours of wearing them before it got a bit irritating already. (I normally wear my contacts as long as 6-7 hours). It’s possible that my eyes are adjusting to this new brand of contacts and I will, of course, wear a pair again soon. When the day or night calls for it. 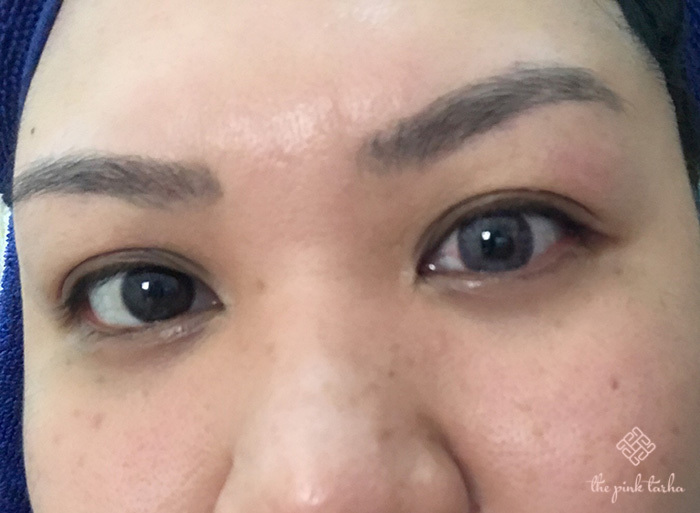 As for the Core Lens, it was a beautiful contact lens that enhanced the brown of my eyes. It made it look bigger and more intense. I wore it in a birthday event and I didn’t feel any discomfort. It also came with its lens case and a tong for handling it. I can see myself wearing this more than the FreshLook. I tread the trend of wearing contact lenses lightly. First off, I’m probably the only person left in my circle of friends who doesn’t wear eyeglasses, let alone contacts. I’ve tried them before about once or twice more than five years ago for styling purposes but other than that, my experience in using them is very limited. 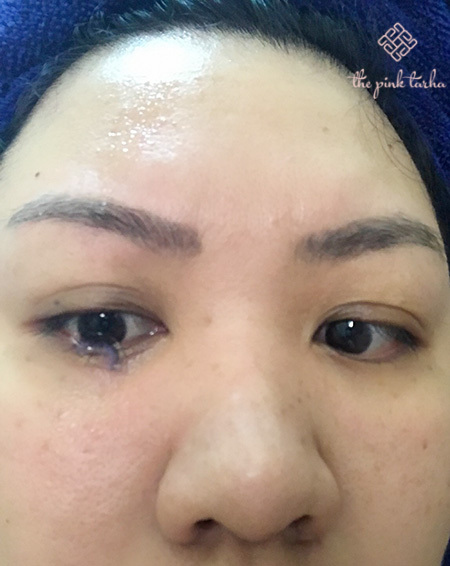 Secondly, I’m not fond of the feeling of my eye being poked (that’s what I feel when I try putting them on) so suffice to say, my experience in this product review felt like a fish out of the water. But of course, I’ll try anything once. When Janelle showed me the site, I tried to pick a color that wasn’t similar to my current eye color (which is dark brown). I ended up choosing the shade Amethyst from the FreshLook line. Janelle gave me the package when it arrived and I prepared myself the next day. One box had the contact lenses in their original cases and another contact lenses case came from the eyewa brand. A whole bottle of solution came with it as well, which I almost mistook for eye cleansers. Lol. I told ya I’m a noob. Ready for my lenses from eyewa! The Fresh Look lenses in their individual packaging. Solution fluid for the contacts! One with lenses. One without. The amethyst/violet color of it was subtle but you could that my eye color has definitely changed from its normal appearance. Despite my difficulty, I didn’t experience any irritation at all that made me want to totally stop trying in getting them. I was surprised that my eyes didn’t turn red from all that popping in and out. While it did look good and I didn’t have any major issues with the quality of the lenses, my eyes were simply not used to having a foreign object in there. Perhaps if I had the need to wear contacts, I could get used to it over time. eyewa currently delivers to GCC countries. 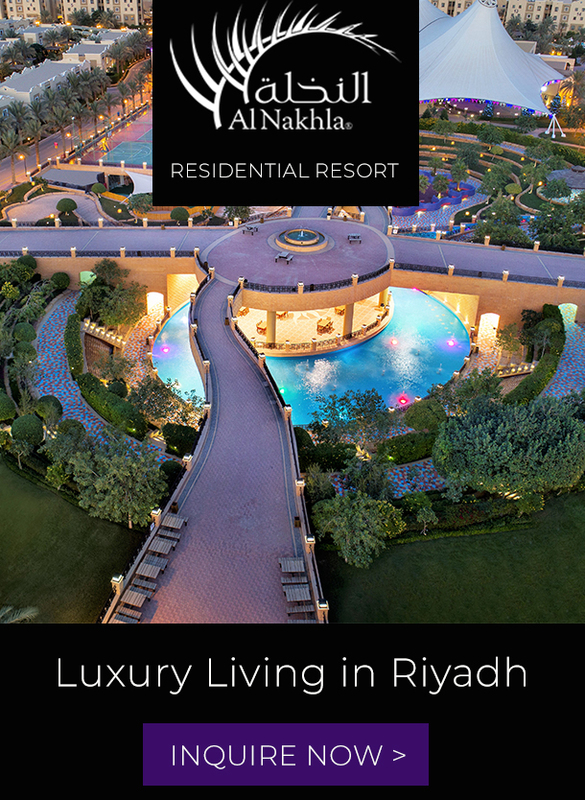 Delivery is within 2-4 business days in the UAE and 3-5 days within KSA and the rest of the GCC. If you’re buying a frame with corrective lenses, then it will take more time. You can pay online upon order via credit or debit cards or you can also pay with cash upon delivery. For any questions and changes to your order, you can email customercare@eyewa.com. You can read their Exchange, Refund and Return policy here: https://eyewa.com/aed_en/return-policy. Also, you can use “pinktarha15” at checkout to get a 15% discount off your purchases!!! Disclaimer: eyewa sent these items to us free of charge. Our opinions and feedback are our own. 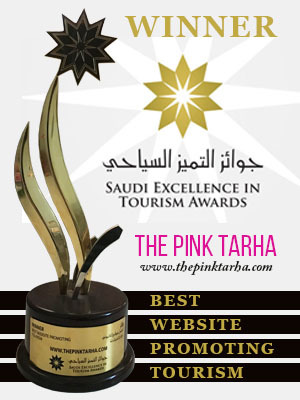 The “pinktarha15” code is not an affiliate code. We do not earn anything from it when you use it at checkout.